Scottish five-piece Breabach deliver a thrilling and unique brand of contemporary folk music that has earned them international recognition on the world and roots music scene as one of the UK’s most dynamic and exciting bands. Having been previously released internationally, Breabach are delighted to announce their award winning fifth album Astar (translating from Scottish Gaelic as distance or journey) will be released in Australia on Friday 2 February. The music on the album takes inspiration from the beauty of both the places and people the band have visited and the wonderful musicians and cultures encountered along the way. Working with producer Greg Lawson (BBC Scottish Symphony Orchestra, GRIT Orchestra) the band have taken melodic, rhythmic and harmonic ideas from each of the countries they have visited. The lead single from the album is ‘The Last March’, composed by the late great Cape Breton fiddler John Morris Rankin. Rankin was one of the most highly revered and influential fiddlers and composers of all time and sadly lost his life in a tragic car accident in 2000. His spirit and music live on through recordings, sessions and festivals all over the world and this melody with Breabach is thought to be one of the last he ever composed. The album includes Australian musicians the band have become friends with during their previous visits Down Under. Yidaki (didgeridoo) player Mark Atkins performs on ‘The Last March’, ‘The Striking Clock’ and ‘The White Sand of Jervis Bay’, with extraordinary Aboriginal artist Yirrmal Marika singing a traditional song from Arnhem Land on ‘The White Sand of Jervis Bay’. Other special guests that lend their musical talents to the recordings are Maori tradition bearer Scott Morrison (NZ) who performs a newly composed Haka for the track ‘Muriwai’, Quebecois violinist Olivier Demers of Le Vent Du Nord (Quebec) and Hardanger virtuoso Olav Luksengård Mjelva of Nordic Fiddlers Bloc (NO). Breabach unite the talent of members Calum MacCrimmon (pipes/whistles/bouzouki/vocals), Ewan Robertson (guitar/ vocals), James Mackenzie (pipes/flute/whistles), Megan Henderson (fiddle/vocals/stepdance) and James Lindsay (double bass). Since launching their career as winners of the Open Stage Award at Celtic Connections in 2005 the band have steadily moved from strength to strength, picking up accolades and performing at esteemed events along the way. 2017 began in exciting fashion as receivers of the Scots Trad Music Awards ‘Folk Band of the Year’ for the second time and ‘Album of the Year’ for Astar. A special Celtic Connections show to celebrate the album was held in Glasgow’s City Halls and was received with a sell-out crowd and 5-star review in the Scotsman. The momentum continued with nominations for ‘Best Band’ at the BBC Radio 2 Folk Awards and for ‘European Album of the Year’ in the Songlines Music Awards. This was underpinned by a packed live performance schedule including tours of the UK, Sweden and Canada and an exciting, energetic festival season across Europe. 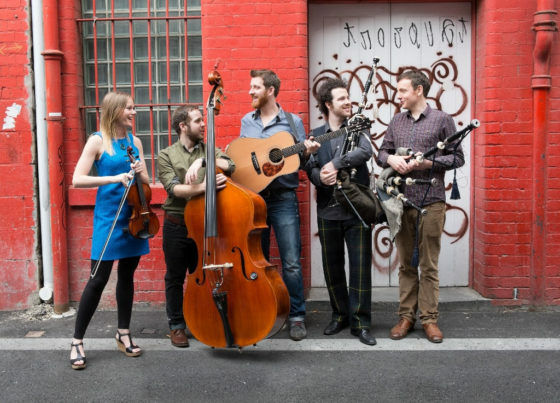 2018 will see Breabach back in the studio to record a sixth studio album as well continuing their adventures across the globe with tours of the UK and Australia to kick things off. Delivering an increasingly mature repertoire and live performance whilst continuing to build their reputation at the forefront of the UK’s world and roots music scene, this is a band at the very top of their game and one not to be missed!